Robert Lewandowski takes the golden boot in his farewell season for Dortmund to no doubt replace Mario Mandzukic as the centre of Bayern's attacking trio up front. On just goals, Lewandowski has out scored the Croatian and has done so in a weaker team. 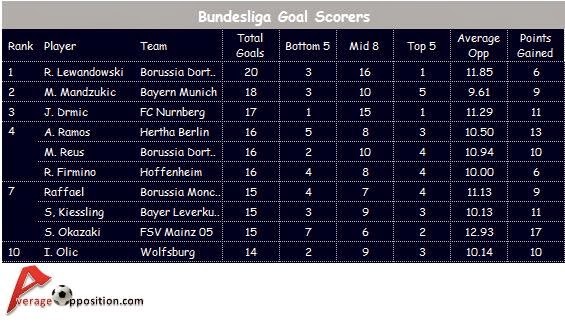 However, scratch a little deeper and you could argue that Mandzukic's goals have been more important - scoring a massive 5 goals against the other Top 5 teams - with two goals against both Schalke and Wolfsburg, as well as scoring against Leverkusen. Lewandowski on the other hand has just one goal against Top 5 opponents, equalising in Dortmund's 2-1 over Wolfsburg. Mandzukic can also claim to have scored more decisive goals than his replacement, contributing to 9 points for the team compared to Lewandowski's 6. In terms of penalties, Lewandowski scored four compared to none for Mandzukic. Will the Polish striker be an improvement for Bayern? Elsewhere, only one player has more goals against the best opponents than Mandzukic, Hoffenheim's Anthony Modeste. He scored 12 goals (none were penalties) and half of them were agaisnt Top 5 opponents, as the Frenchman notched against Wolfsburg, Schalke and Bayern (for the full list of stats, click on the Bundesliga tab on the top Menu). He can lay claim to being the league's big game player/scorer whilst Mainz's Japanese international Shinji Okazaki is the most important to his team in terms of goals, winning 17 points for the team from just 15 goals. At the other end of the scale, Arjen Robben and Frank Ribery contributed a combined 22 league goals, worth just 2 points between them. In fact none of Ribery's 10 goals were decisive to the final result. The flat track bully label can be hung on Josep Drmic who scored 17 league goals, only one of which was against the Top 5 teams, although it was actually Okazaki who scored most against the Bottom 5 teams with 7 of his 15 goals coming against the teams fighting relegation. As you'd expect, this is heavily dominated by Bayern. They had the most wins versus the Top 5 (6 from a possible 8). In fact they had the most wins against Bottom 5 teams, and also the middle 8 teams. I guess the headline here would be that they won a lot of games. As always, AverageOpposition delivers a unique insight into football. Behind Bayern were Monchengladbach who managed a decent 4 wins against the 5 teams above them. Great job fellas. Dortmund must be rightfully embarrassed to have lost to them. Hertha actually only picked up one win in their last twelve matches, so their fans must be pleased that the season has ended. In other team stats, Bayern's 7 goals conceded against the Top 5 is the league's lowest followed by Dortmund's 10, but when you consider they both finished in the Top 5, that's only 8 games each. Interestingly (depending on your viewpoint/definition) bottom team Braunschweig only conceded 16 goals against the Top 5 teams, and even managed a decent two wins and two draws against them. In fact they were sort of a big game team, beating an average placed opponent of 8.50 which was the highest in the league - shame they only managed 6 wins. In terms of Losses, no team lost more than twice to the Bottom 5 clubs, whilst four teams didn't lose once to them. Crisis club Hamburg conceded the most goals against the best teams (29) whilst Hannover condeded the most against Bottom 5 teams with 10 against. In the failure to score stakes, we can see why Braunschweig went down. In 12 of their 16 games against the teams in the middle of the table, they failed to register on the scoresheet. At the other end of the spectrum, Bayern only failed to score on two occasions in back to back defeats against Dortmund and Augsburg. Wolfsburg were the next most reliable team with just 4 clean sheets kept against them. 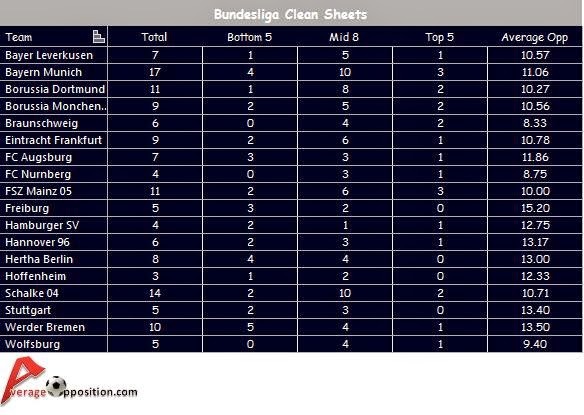 And whilst on the subject of clean sheets, no surprise to hear that Bayern lead the way with 17 shut outs followed by Wolfsburg's 14 - both keeping 10 clean sheets against the Middle 8 teams. Below is the full clean sheets data (you can see the same for Wins, Losses, Draws, For, Against and Failure to Score on the Bundesliga tool bar above). Premier League, Serie A, and La Liga season reviews will be available in the weeks after the leagues end.